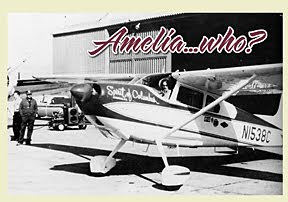 America Can Still be Attracted to Three-Eight Charlie Despite the Box Office of "Amelia"
Regular readers of this blog know I have been pounding the pavement for nine years trying to get Hollywood and the world to notice the huge, monolithic, gargantuan accomplishments of Jerrie Mock, the first woman to fly solo around the world. I've hit plenty of dead ends in this quest, but I have never quit believing in this story and my screenplay about her life and 1964 flight. In writing the script for "Three-Eight Charlie", I have produced each and every second of this film in my head, right down to the tiny details, including the soundtrack. Yes, the story about Jerrie's flight is based on her 1970 book, but my screenplay came completely out of the creative half of my brain. And because I have "watched" this film one million times at the little Cineplex in my head (always with free popcorn), I can assure anyone reading this post that it is a action-packed, heartfelt and accurate portrayal of Jerrie and her flight. So being one of the very few people in a position to have an enormous amount of intimate knowledge of Mock's journey, it was with great anticipation that I awaited the release of "Amelia". The film stars Hilary Swank, who should be box office gold in any film. She is a very talented, very capable "A-list" actor, and while I have not seen "Amelia" yet, everything I have read says she pulled off the role well. "I know that all of America was queasily captivated by the bizarre "is it real or isn't it?" Balloon Boy escapade. But here in Hollywood, heads are being scratched over an equally puzzling mystery: How did Fox Searchlight, which has easily the best box-office batting average of any specialty film company in the business, get stuck with a turkey like "Amelia," which earned a disappointing $4 million box office at the film's weekend?" With a reported $40 million production budget, getting only 10% of that back on opening weekend is pretty sad. As this post is written, the film has been showing for 10 days, and as of 10/30/2009, the film's total reported gross has grown to only $8.3 million. I still believe that the story of Jerrie Mock's success as a aviator in her 1964 flight around the world will come completely out of left field and will be well-received by the public. It will be the fact that she is completely unknown that will pique the ticket buyer's interest - they will HAVE to learn more. Jerrie's story will be one not just about a pilot and her plane, but about a woman's determination to achieve what most said was unachievable. I have read a few random articles stating that "Amelia" director Mira Nair ran into a very large number of creative hurdles as the film was pushing past green light into developing and on to shooting – that there were too many "creative voices" on the project. If these rumors prove to be true, we may never know what kind of film "Amelia" would have been, and how that film would have been reviewed. This whole episode teaches me one thing: I have always known that the Hollywood studio system can be brutal when it comes to bureaucracy and can be where good screenwriting and production ideas go to die. I have also always fully expected a major studio to take my screenplay - and Jerrie's story - and re-write it so much, it becomes something else that does not do Jerrie or her accomplishment justice. My promise to Jerrie Mock when we signed our Life Story Rights Agreement was that I was the one screenwriter on this planet who could look out for her best interests as "Three-Eight Charlie" was being made. But after watching "Amelia" come to market as a pretty "Big Studio" picture that is getting terrible reviews, I know now that the only way to make "Charlie" correctly is to pursue the project as an independent film. It is critical to this creative process that I stay in control to insure the audience that there won't be any bikini scenes, car chases, fighter jet attacks, exploding pyramids or camel races. Just look at "Paranormal Activity", in theaters for just over a month. With a limited release and a production budget of $15,000 (yes, that IS fifteen thousand dollars, no zeros missing), this film has cashed in big with a total US Gross of $84.7 million. This proves to me that a film does not have to go the traditional big-budget, huge crew, buried-in-quagmire studio production route to make money. Umm, yes, we'll need a tad more than fifteen large to pull this Jerrie Mock flick off, but I'm prepared to sit around and wait for the Universe to put this project together for me. And when my Prius Stretch Limo – powered by algae-based biofuel of course – pulls up to that red carpet for the world premiere of "Three-Eight Charlie", and when that first opening scene appears and I see a theater full of young future pilots smile as their love affair with aviation begins, every second and dollar I have spent in this quest will be worth it.